Here are 10 landscape painting tips perfect for beginners. Landscape painting can be as simple or as complex as you want to make it. It is a fantastic subject for those just starting out with painting, but very few artists actually master the art of landscape painting. Whilst these tips are targeted at beginners, even advanced artists may find value in revisiting the basics. Too many artists get caught up in the detail of landscapes. There are times to add tedious detail, but these times are generally towards the end of the painting. The above are only effective in emphasising your focal point if you simplify the rest of the painting. Check out the above painting by Camille Pissarro and look closely at how much detail is added. Notice how when you focus on certain areas of the painting, there is really not much detail at all, just seemingly random strokes of color. But it all comes together in beautiful harmony. Also notice how little detail is used to render the person in the bottom right. Without the rest of the scene, it would probably not resemble anything. 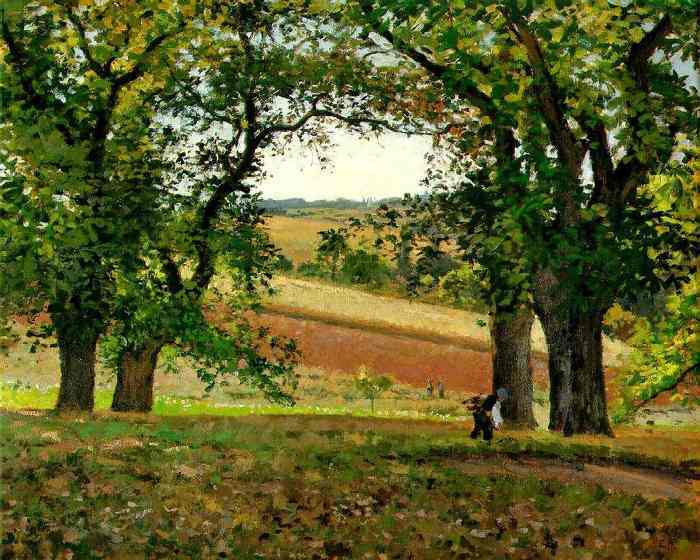 Pissarro has used simplification in this case to draw attention away from the shadowed foreground and bring the viewer through the trees into the high-key background. Too much detail in the foreground would probably make the painting seem too active. The palette knife can be a valuable addition to your painting artillery (it is not just for mixing your colors). I find it best used in conduction with paint brushes. However, you can of course complete entire paintings with just palette knives. This certainly creates a very interesting effect. Check out Leonid Afremov below. He pretty much only paints with palette knives and does pretty well for himself. In landscape painting you will come across many situations where it is much better to give the illusion of numbers rather than to try and paint every individual object. For example, if you have a forest of trees, you should not try and paint every individual tree. That would be remarkably complex. Rather, you should paint the general shapes and tones of the forest, then detail just a few trees. This will make it look like a forest without having to paint every single detail. 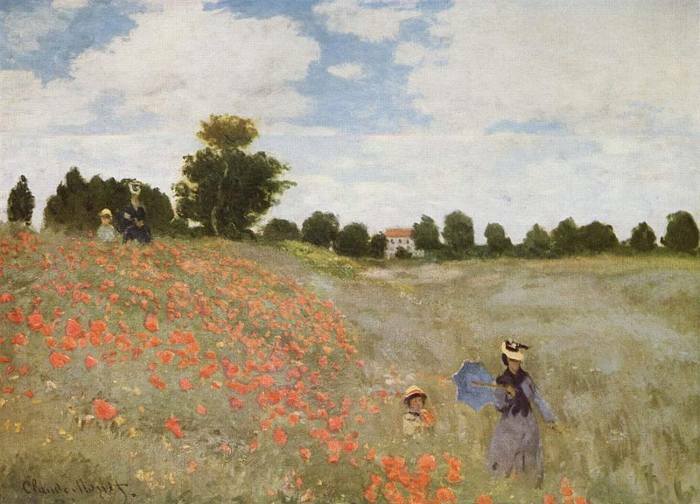 Check out the grass and trees in the above painting by Claude Monet. There is little doubt they are in fact grass and trees, however there is basically no detailing other than some subtle variances in tones. A problem many beginners face when painting landscapes is they do not create enough subtle variance between the colors. Then painting will often then lack any depth and look very two dimensional. Many landscape paintings do not have a complex color composition, but rather a simple harmony of greens, blues and earthy colors. To ensure your painting does not end up very monotonous, you need to create subtle variances in areas with a narrow range of colors (varying tones, values, temperature, etc). For example, you can break up a large plain of green grass by adding some strokes of yellow ochre. With that being said, you should not try and create variance just for the sake of it. Try and paint what you see. If there is little variance, then that is fine (thought rarely the case in nature). Color temperature is a scale of how cool or warm a color is. Cool colors include your blues and greens, whilst warm colors include your yellows, oranges and reds. However, you should not think of color temperature in absolute terms. Instead, you should think of color temperature as a relative scale compared to the other colors in your painting. Say for example you have a cool blue color and you mix in a touch of orange. This mixed color will be WARMER than a blue without the orange mixed in. Similarly, you can have an orange with a touch of blue which would be COOLER than an orange straight from the tube. So even if your painting only has cool colors, you should still be thinking about color temperature (for example, you may want some warmer greens in your tree where there is more light). Above is one of my favorite paintings by John Singer Sargent which features Claude Monet (you can read more about it here). 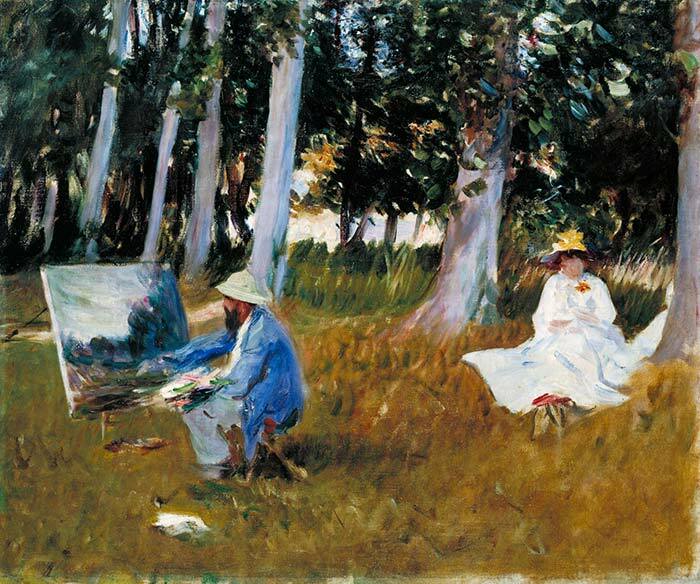 Notice how Sargent uses warmer greens to bring attention to the foreground (in contrast to the cooler and darker greens in the top half of the painting). Imperfection is just part of nature. Learn to embrace it and try not to make everything perfect. You do not have to be completely accurate with values, colors and structure as compared to still life scenes and portraits. There is a slight amount of leeway in landscape painting (however this is not an excuse to be sloppy). Just remember you are not trying to create a perfect rendition of the scene (if you want to do that, then it would be easier to just take a photo). When you are just starting out, you will find it easier by starting with all the darkest values in your painting. From there you can work up in value towards your highlights. For oil and acrylic painting, you should not start with the highlights first. This would be very difficult to judge the correct value and the highlights would likely mix with the darks and result in a cloudy effect. However, for watercolor painting, it is common practice to start with the highest values and work down. 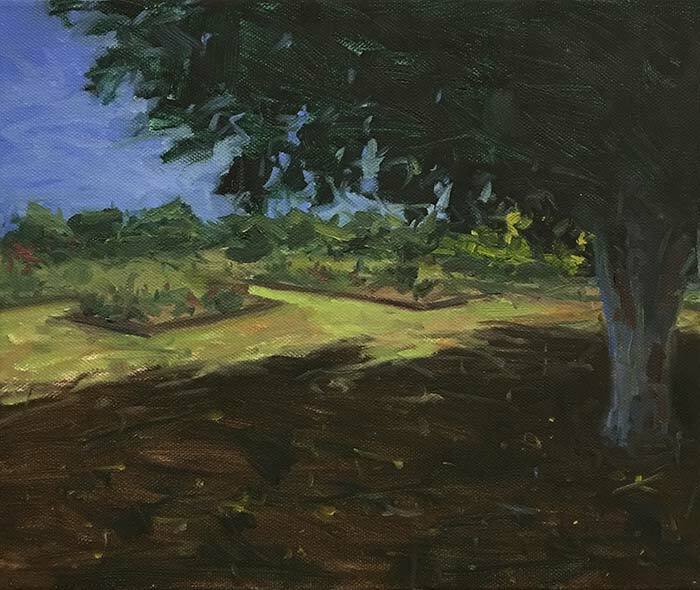 One of the best ways you can improve your landscape painting ability (and painting ability in general) is to incorporate timed or just quick sketches into your training. You could do these plein air or from a photograph – it does not really matter. I would keep the canvas size very small and paint a simple landscape scene. But try and finish it within a certain period (not more than 20 minutes for example). The finished product will not be perfect, but that is not the purpose of it. By painting these fast landscapes, you will learn to paint more instinctively and train your ability to judge values and colors. Here is a real quick sketch I did using oils based on a sunny day at New Farm Park in Queensland, Australia. All up this probably took me about 15 minutes (it is only a small canvas). Sketches like these really help me get a better judgement for values. This goes for every type of painting. You should try to think about the elements in your scene not as clouds, trees, water and grass but rather as various shapes, lines and colors. If you focus on painting these shapes, lines and colors then you should (with proper execution) have a painting which looks like your landscape. If instead you start trying to paint clouds, trees, water and grass, then you may end up painting from your imagination rather than what is actually there. As a result, your trees may end up slightly more green than they actually are. Or the sky more blue. 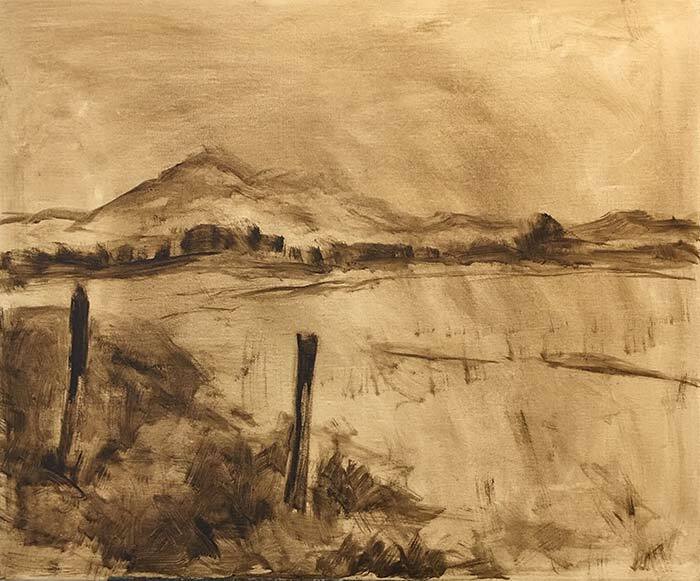 If you are struggling with hitting the right values in your landscape paintings (how light or dark something is) then you may want to consider parting ways with color every now and then and painting the landscape in just black and white or a monotonous color range (i.e different tints and shades of raw umber). This will help you judge how light or dark the landscape is. You may be surprised how difficult this is. Value is widely considered one of the most important variables to a painting. I hope you found these landscape painting tips useful. The landscape is seemingly simple to paint but extremely difficult to master. If you have any tips of your own for painting the landscape, please share them in the comment section. Another technique I use in landscapes, especially in oils, is to render the paint very thickly in the objects closest to the viewer, ie the foreground. Background, including sky and clouds can be thinned out. This helps to improve the depth of a painting. Great tip Norm. The palette knife can be great for this. Thanks Dan,absolutely the tips are really useful .I just started learn how to paint landscape. No problem at all Winnie! Thank you so much. You give me a lot of pleasure. I find you are helping me to get back to enjoy painting after a very difficult time. Use a view finder to block out the clutter! Looking forward to all advice and help , been concentrating on portraits. Thank you for offering these tips for landscape painting. I have been painting off and on for some years but want to get more serious about getting better at it. So, everything I can learn will be very helpful to reach my goal. Thanks for the Great advice. I also found discovering the negative space helps you stay away from preconceived thoughts on how a painting should look. Throwing in tabs of blue sky on an over painted leafy tree can really add impact! Use of a viewfinder is a good idea. I took up landscape painting very recently following retirement. I used to write articles for magazines and newspapers in English speaking countries and frequently submitted photographs for more money. Thus I learned the selective nature of the camera viewfinder. It’s a rectangle (for 35mm) and by moving forward or backward, you change what is included. I now use a piece of stiff black card 36cm X 24cm with a piece cut from the middle 6″ X 4″ and that’s my frame. I use this on my walks (I live in the country) and sketch what I see in pencil. Later, I use this sketch as a plan in my little studio. It took me a long time to decide on landscape. It was a picture of John Constable’s Sunset at Stonehenge that made my mind up. Painting? It all started with a book from a charity shop – £2:50.